What about Miami Beach City(MBC)? MBC, southern most city in USA is in the State of Florida. Miami City (MC) is located just opposite bank of Biscayne Bay. As the transit city of South American countries and Caribbean islands, MBC has never stopped exchanging people and goods. It is a well known and popular place as the paradise of everlasting summer for aged retirees to spend their second lives and as villa residence for millionaires. However, the real thrill of MBC is still "sea". 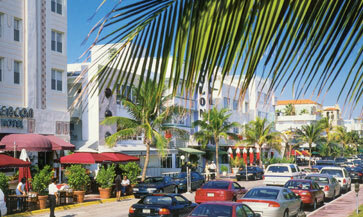 White sand and palm trees alongside Atlantic Ocean and blue sea as far as the eye can reach are MBC's fantastic features. Through roadside palm trees, modern houses decorated with "Art de co" and painted with pastel colors are seen. Area decorated with "Art de co" becomes busier in the evening. Many restaurants and bars are found and perhaps wandering the area and dropping in the some of them are good things to do. Seeing is believing! 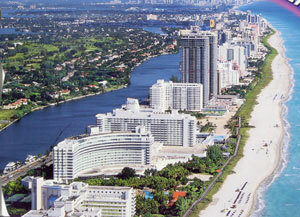 After knowing the charming city, you can not help visiting and seeing Miami Beach City!